The Fiscal Impact Handbook is a unique manual detailing practical methods for determining the full range of revenues and costs associated with residential and nonresidential growth. Planners, economists, businessmen, administrators, financial officers, assessors, community groups, private organizations, and those interested in the fiscal consequences of growth and non-growth will find The Fiscal Impact Handbook indispensable. 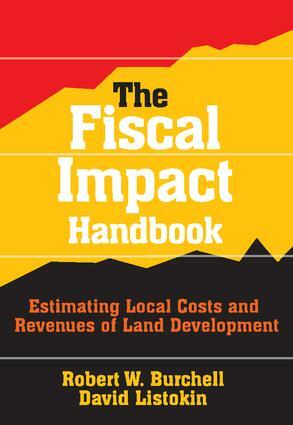 Fiscal impact methods are presented in a clear, step-by-step format and are capable of being carried out by the practicing planner with minimal procedural problems.The manual is designed as a basic tool to be used for projections of direct, current public (and private) costs and revenues resulting from population or employment change to the local jurisdiction in which change is taking place. Standardized methods are presented with attention paid to the underlying assumptions, limitations, and applicability of these methods. Necessary factors affecting the planning and legal framework and documentation of key data input are covered for proper utilization of fiscal impact methods.Detailed examples are given to the six flexible methods, presented with suggestions on how they can be modified by the user to meet requirements. In addition, current computer models of analysis are evaluated for operational needs and benefits. Included also is a comprehensive bibliography of the cost-revenue field and an index for quick, easy reference. This is an invaluable work for urban analysts, planners, and developers written by two of the top minds in the field of urban policy. Are Fiscal Impact Considera Tions Acceptable Municipal Activities or Requirements?